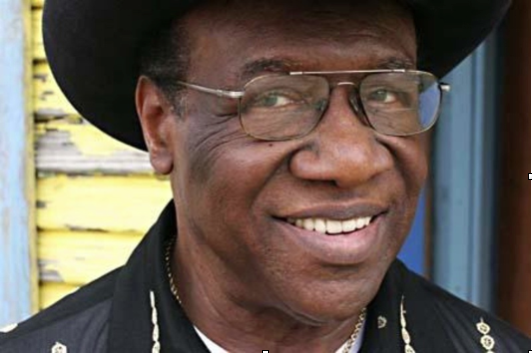 Born in La Grange, Texas in 1934, Henry “Blues Boy” Hubbard is one Austin’s most legendary living musicians. He arrived to the Texas capital in the 1950s, while he worked as a mechanic at the Bergstorm Air Force Base, and soon developed his band Blues Boy Hubbard & The Jets in collaboration with local musicians –including L.P. Pearson and W.C. Clark, and black impresario Charlie Gilden (Charlie’s Playhouse; Chicken Shack), with whom he formed an enduring and productive partnership. 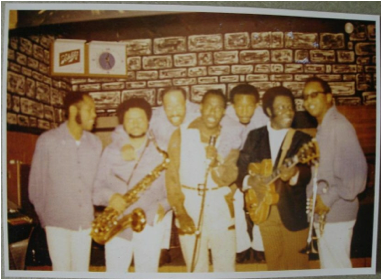 Established as regular house musicians at Charlie’s Playhouse, Blues Boy Hubbard and The Jets decisively contributed with their music and entertainment to transform the state of race relations in (East) Austin within the 1960s African American Civil Rights Era. While still unknown to many in the international blues scene –mainly due to his discrete recording career, Blues Boy Hubbard is a firmly established, regional live-music institution, as well as an influential mentor and unavoidable character within Austin’s particular history. His remarkable musical and social story sharply illuminates some of the ways in which the complex intermixes of popular music, race and economics have been articulated in contemporary history. Self-confident and outspoken, Hubbard continues to perform regularly as a member and periodical leader of the Texas Eastside Kings, who proudly continue to represent the “old-school”, electric, postwar blues. I believe you started playing piano, you also played trumpet for a while, and you’re well-known for playing guitar. Why and how did you learn so many instruments? My mother was a musician. She never went to school for music but that was her talent. In other words, she was born to play music. Her brother and my dad told me that she would just sit down to an instrument and started playing it. She sit down to the piano and start playing it, she picked up the harmonica and start playing it, she got on guitar… Any instrument she touched, right away she knew: “I can do this”. So if she spent a week or two she would learn that. At that time it’s not like it is nowadays; record shops and records all over the place, you know. At that time, I had to wait till the next day when the disc jockey in Houston played that same song again. The guy was Doctor Daddy-O and he had a 15-minute program in Houston. When he played it the next day, I´m waiting. So I got just a little bit more. I got something with my right hand: [Blues Boy sings a little melody], stuff like that. That’s how I started playing. And I was real lucky because our piano just happened to be in the same key of the radio station. Sometimes that don’t happen. He may be playing it in C and when I go to my piano it winds up in C#, and if it does, boy, you’re in a lot of trouble. But it did, it was just lucky that the keys were just perfect with our piano. Music to me is a talent. It just comes down from generation to generation, just like people are born diabetics because their mother or their father was a diabetic. Music is the same way: it’s a talent. Some guys are very athletic, football wise and all that kind of stuff. Me and my brother was lucky because my father was very athletic so me and my brother picked up on that. We were as quick as lightning, ‘cause my father was fast. The guys that grew up with him will always tell me: “Boy, you’re fast like your dad!” Because everybody would say: “Your Dad, boy, could be out playing baseball and you couldn’t hit a home run if it weren’t for him, because he’d take off and get it.” Those are just talent that you take and hand down from generation to generation. Music was one of my talents just like sports was me and my brother’s talent. We both played football and basketball at school. Our school was an all black school; it wasn’t a huge school like it is now. Integration brought about a big difference, but at that time our school was all black. It helped me for one reason because being an all black school the white school would send the musical equipment that wore out to the black students. When I got in the marching band at the age of twelve, the rest of the people in the band was 14, 16, 18, 17… but at the same time I was the only one in there that had that kind of music ability because my mother sent me to a private piano teacher at the age of twelve. Miss Cook had went to college, and by her being a black lady that looked white she went to a white college because they didn’t know any better. She looked white! So she learned a lot, she had a master degree in music. She taught me theory: how to read music, how to write music, how to arrange music, how to transpose from one key to another key. She taught me all of this kind of stuff so when I got in the marching band at twelve I was pretty much as smart as the music director. He discovered that right away so he said: “H.L., you’re gonna be my utility man.” You wanted to play trumpet but I got a first, second and third trumpet, so I’m gonna let you be the utility man. You play flugelhorn, trumpet, French horn, clarinet… whatever instrument I need that I don’t have in the brass instruments you will do it because you can read. He put some music in front of me and I just sat there and [Hubbard sings a tune]. The rest of the guys couldn’t read music except for what he had taught him. 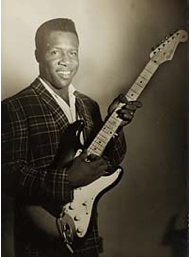 “Blues Boy” Hubbard in the 1950s What were your blues guitar influences? T-Bone Walker, Clarence “Gatemouth” Brown, Lowell Fulson, that’s how I heard guitars and said: “Man, I wanna do that!” And all these guys that I had never heard of like Freddie King and Albert Collins, they were still young and didn’t have out no records. What makes Texas blues different to other types of blues like Chicago or Delta? Well, let me put it to you like this. People that goes to Chicago and said it’s Chicago blues, most of those people come from Mississippi, Louisiana, Texas… and they just go out there and people get together and say: “Man, we’re gonna call this Chicago blues”, but those guys are not from Chicago most of them! Blues is blues to me, you know. When I hear a guy from Chicago playing the blues I don’t hear a whole lot of difference. Maybe the other people do but I don’t. If you’re a guitar player from Texas, Mississippi, Alabama or Georgia, it don’t make any difference to me. I don’t jump off and say: “Oh, he’s a Chicago guitar player…” He don’t sound any different from Freddie King! And we all stole our licks from big T-Bone Walker. Just about every black guy that plays guitar stole his licks from T-Bone Walker, “Gatemouth” Brown and Lowell Fulson, that’s how it all started. Then Freddie King came along, [and] Albert Collins, Albert King… It ain’t no difference, just licks is a little different. What was the relationship between church and blues? When I went to private piano teaching and learnt to read music, I used to go to church every Sunday because my mother was the Sunday school director. She had me playing there doing different things. I had what they call a spiritual faith book; it had all the songs on there. My mother told me she wanted me to play piano for the Sunday school and I did. They had a guy, we called him brother Poo and he played piano for the senior choir at church and everything. After he died my mother took over at the choir. At that time, when you play the blues you’re sinning. Church people would try to kind of dance around people that played the blues from people that went to church. But it was all a big front, that’s really what it was, a big front. Because I have played to people that are in church and come to see me play the blues, and they enjoy. Between spiritual and blues it ain’t very much difference. The notes you play to play spiritual, you’re gonna play the same notes to play blues or jazz. They don’t write separate notes; it’s what you think as an individual person or a group. Now most people that’s playing in the church all their music sounds blues, hip hop, rock ‘n’ roll, jazz… it’s all of it just one thing. I turn into a spiritual channel on my television and I’ve heard that same kind of rhythm and same things with Earth, Wind & Fire. What can you tell me about the black music tradition in East Austin? When I came here and started playing I was playing piano with a trio: me on piano, a guitar player and a drummer. The music that we were playing was the same one that they do now, what they played out on the radio. They had Bobby Bland, Hank Ballard & the Midnighters, Junior Parker, Little Richard… Those was mostly the blues thing then. Little Richard had a lot of things back in the late fifties and sixties that later kind of moved along and most of the white guys started doing Little Richard songs… [Laughs] Little Richard just faded out! So I went and bought a guitar. I bought a Stratocaster for $299 and a telecaster for $199, a few guitars now sell for $20 thousand! [Laughs] It was a 57 Strat and later I bought a 57 Telecaster. I put a band together. One little twist in this, most blues bands was a trio (guitar, piano and drums) but I got a guitar, and a guy named L.P. Pearson playing bass on a guitar. He took the three little strings out and left the three little big ones on there. With him playing bass on guitar, me playing lead, and a piano player and a drummer, that made the whole group sound bigger, with more rhythm going on. Because I did this and went to the Show Bar which was down the street and much bigger place than the Victory, by the time we kicked off on a Monday or a Friday we had a packed house. The Victory was nobody in there but the help, the band was sitting there looking at each other. Me and L.P. [Pearson] stole a hell of a crowd at the Show Bar. But most people that was coming on 11th street was coming from further East Austin –in the projects they call it. They would walk up so when they got to the Show Bar before they got the Victory and for some reason they liked what they heard in the Show Bar. So they stopped, paid and came in there and wouldn’t go to the Victory. So after about a week or two the Victory didn’t have nobody in it. Everybody was at the Show Bar and me, L.P and some other guys were just knocking them out! W.C. Clark told me he also got to play in your band. L.P. taught him to play bass the same way he was playing bass, with a guitar putting a clamp on the neck and moving it up to each key. When I first met W.C. he came to the Show Bar and asked me if he can do a song. I said: “Yeah, sure.” And L.P. said: “Yeah, man. I taught him how to play”. And he got up there and started playing, just like L.P. were. How was the band Blues Boy Hubbard and The Jets created? That name came about because I was a jet mechanic. I went to jet mechanic school in the airforce and I was stationed at Bergstrom. When Charlie needed a band he called me at the base and told me that the rest of my band guys is at the Playhouse and they wanted me to be the band leader. He said: “What I’m gonna do is guarantee you all money every week. I’m gonna give you all a salary”. Charlie had changed the Show Bar to the Charlie’s Playhouse and when I got to town that evening they were all standing outside. There was a guy in the group who is out in California now, his name was A.J. Manor –he played trumpet and sing- and he suggested that I’d be called “Blues Boy Hubbard”. I said: “Ok, Blues Boy Hubbard, that’s what it is”. Charlie said: “Now the band got to have a name” and I said: “well I’m a jet mechanic at Bergstrom so why not the band be ‘The Jets’?” Everybody said “cool”, you know. So that’s what it was: Blues Boy Hubbard & the Jets, and that’s what it’s been from 1958 I think till now. How did the scene change in the 1960s with the arrival of white students? Well, how that came about was I had myself on guitar, a bass player, drummer, piano, trumpet… Because I had not only the talent but the background knowledge for music, I knew what sound good and what didn’t sound good. I could play pretty much every instrument in the band. I could play anything, I could teach you to play drums, and I did that with Jewel. A lot of guys just think all you do is beat it, just keep rhythm. It’s more to that when you’re playing drums but a lot of guys doesn’t know that. I was able to teach everybody in the band precisely what it was on the record, so we wind up sounding exactly like the record. We sounded just like the record. In fact, some of the kids from the University of Texas would come up to the bandstand and say: “How do y’all sound so much like the record?” And maybe the bass player or somebody say: “He shows everybody their part” [laughs]. So it all comes out the same. It’s not like I go home and learn the way I want it, you go home and learn it the way you want it and when we put it together it’s: “yeah, right…” Everybody did it the way I wanted it done, and I was gonna do it just like the record –every instrument, every horn part. That’s what made us sound good and we were all together like a football team, that’s the way I had the band going. We might play three gigs in one day. We’d play like the Seventeen Canteen over here in Cedars for the young white teenagers. You know, youngsters. Then we’d come to Charlie’s Playhouse and we would have a pool full of white university students, and then we’d go afterhours and play to all of the East, West, North, South side of town. That would be out here in the Chicken Shack. The Chicken Shack is still there but it’s a food place now, a fast food place. What was the effect of growing white audiences and musicians in the Eastside? The word got around that they’ve got this blues band in East Austin called Blues Boy Hubbard & the Jets on East 11th Street. So Charlie had a girl who would come to the Playhouse and open up all the time, take phone calls and all this kind of stuff. Well, those fraternities started calling her and they wanted to hire that band that they say it’s in East Austin that sounds so good. She would tell me and Charlie about this and Charlie would say: “Well Hubbard, we can get together and I’m paying all a guarantee, but I would give you all an extra amount of money and we go and play at those fraternities…” I said: “Yeah, that’ll work”. So we started playing the fraternities and if we play one this week then one of them would ask: “How do I get to come back to the Playhouse to hear the band next week?” We’d give him the number and tell them to come and reserve a table however you want. He said: “Well, I think I got about twenty people.” So he would call and reserve tables for twenty people. We’d play another fraternity next week and pretty soon we’re gonna play almost every fraternity in the University out there. What that did, they got wise and they would call Charlie’s early on Saturday and reserve tables for ten, fifteen, twenty, thirty… When the black people that would come to Charlie’s would get there they would see all these tables empty, so when they get ready to go in there to these tables Miss Ivy -Charlie’s wife- said: “Hold it, hold it! You can’t go over there and sit down.” They said: “Why not? I don’t see anybody over there” and she’d tell them: “Those tables are reserved”. 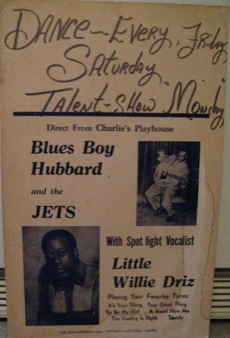 Charlie’s Playhouse advertisment with Blues Boy Hubbard and Little Willie Driz. (Courtesy of Deborah Graham). Pretty soon, black people will come to the club and realize that there ain’t no tables and chairs for us. “What’s going on?”, you know. What they didn’t realize is those fraternities’ brothers and things would reserve the club ahead of time. That got to be a heck of a confliction there. Because here’s a black club and ain’t nothing in there but whites! Black people was getting mad, they were getting angry about that. They was talking about Charlie and the band, and everything else… “We got a black club on the Eastside and it has turned white!” But they never would reserve because they felt like: “This is a black club so why should I call up there and reserve a table.” But there were some blacks like a guy and his wife or maybe four or five of them, they would call and reserve too. One of the things about Charlie, when you got to his club he demand that everything would be right. Nobody’s coming to your table, messing with you, trying to dance with your wife and you don’t want him to… all that kind of stuff, you know. Charlie made sure none of that happened, so what he’d do to help himself do it he hired a bouncer to come out and be standing. Most clubs didn’t do that but Charlie did. Friday and Saturday at the Playhouse was a packed house but it would be basically all white. Now Ernest’s Chicken Shack saw the split, it was white and black. We leaved the Playhouse and go straight to the Shack, and that crowd –in the beginning- was mixed. When it got up into the seventies, Charlie’s Playhouse was almost all Mexican. And when Charlie died in 79 the Shack was all Mexican. You had a few black sitting over here and a few whites over there but the Mexican took over the Chicken Shack [Laughs]. We we’re still playing there. But that how things got all tilted there. By us being playing and fraternities coming over and booking, we got fraternities in San Marcos coming over, in Georgetown, Texas A&M people trying to get there… the place wasn’t big enough for all these people. You know, the word just got around: Charlie’s Playhouse, Blues Boy Hubbard & the Jets, “the best in Texas or anywhere else!” We we’re playing for the governor, lieutenant governors, parties, country clubs… In fact, it got to where we just couldn’t play all these gigs so Charlie and I got together and we got up on the price. But they paid it. We were getting five, six or seven hundred dollars a gig when everybody else was getting $200. So it got to a point when what Charlie had to do was put together another group: Gene & the Roulettes. They got real popular that way. How was the experience of backing touring blues artists? That was a lot of fun and we really enjoyed. What happened, we got together and started a Blue Monday talent show. So Fridays and Saturdays [at Charlie’s Playhouse] is pretty much all white; Mondays on the talent show was all black. Sundays was the only night that was still a little weak. There was a disc jockey who once had the Show Bar –his name was Tony Von. He was the disc jockey in Taylor (Texas) and he would play all of the black music through the week. All these artists like Bobby Bland, Junior Parker, Hank Ballard, Ike & Tina Turner, Etta James… All of these people owed Tony Von so what he would do was get them to come and perform at Charlie’s Playhouse with us the band, with our band, Blues Boy Hubbard and the Jets. He would pay us extra because Charlie was already paying us to play Sunday, whether we play it or not. So Tony would just give us a little more and then he could book Bobby Bland for two or three hundred dollars. But we had to play behind them, see. That’s what he did. He got everybody like that: Freddie King, Johnnie Taylor, Etta James... What would happen on that particular Sunday? The club will be pretty much all black. There would be a few white but mostly black because the artists was always a black artist. It got to where Fridays, Saturdays, Sundays, and Mondays it was a full house at Charlie’s Playhouse. The business just grew and grew. In fact everybody could see on the West side that Charlie was making a lot of money, so then they started giving him offers to buy the Playhouse. But it never did work because Charlie would never sell it. He said: “No way, I know what you’re trying to do now. You’re just trying to buy me out so y’all can make the money!” So he would never sell the place… and nobody was able to buy me out to go to the Westside because I knew what was going on. No soon we go over them and pack them club, then they hire a white band, born out to just that. So we never did leave Charlie’s, I never did leave Charlie. There’s guys in the group that went this way and went that way, but as long as Charlie had me, Breeze and Jewel, I could keep the band together. Where did the expression “Blue Monday” come from? There’s also a song by Fats Domino with that title. Well, I can’t really explain that. All I know is people saying: “Man, we got a Blue Monday!” It’s just a slang, that’s about all I ever got out of it. “Blue Monday Talent Show”, you know. The song by Fats Domino had nothing to do with it. It was Monday and you know on Mondays everybody is blue and everbody wants to just slumber around, so they started it calling it the Blue Monday Talent Show. We really had a big show. We had people coming from Houston, Dallas and San Antonio just to be on the show. What has your relation with the current Texas East side Kings been? The guys in the Eastside Kings right now was once the Jets: Kuykendahl is the leader right now, he plays the bass. Ok, he played with me for like ten or twelve years. The trumpet player [Donald “Duck” Jennings] –he plays flugelhorn now, he played with me off and on for seven or eight years. [Charles] Shaw, the drummer, he’s played with me with The Jets. All these guys in the band was once a Jet. After I got old, 70 years old, I said: “Man, I’m tired of this crap”. I told Scott and Debbi [Graham. Debbi said: “Hubbard, I’m sorry but I’m getting where I got no feeling in my hand.” So we all split up but as luck would have it Kuykendahl called me and said: “I need a guitar player.” So I started playing with them and they would call themselves The Eastside Kings. I’ve been playing with them now for five or six years. What you think about the tag “Live music capital of the world” after all these years playing in Austin? Well, it was something that was bound to happen. Like I said, we got real popular and people heard of us all over. We had magazines and things that came out with Charlie’s Playhouse and The Jets. People from California to New York had heard of Blues Boy Hubbard & the Jets. Then what happened was a guy named [Clifford] Antone came over to the Eastside. A guy that I taught to play guitar –his name was Bill Campbell, he brought Antone over there to hear us. When Antone heard us he said: “Man, I have to open up a club!” And so he did open up a club and was featuring blues. Most of the time he would get the Chicago blues in there, and whoever he could. He would get most of the big artists and he had to put together a house band just like we had in Charlie’s Playhouse. He started off on 6th Street and then they bought 6th Street out with the banks and things, and he moved to Anderson Lane. That club he said would sit fourteen hundred people. So you would go there and it would be four hundred in there but it looked like it was empty! That was a bad deal. So he opened up the club in Guadalupe and that was it. That was the swinging club, Clifford. He would have that place packed, almost every night. The place would only sit about 250-300 people. But he had all the big-time bands in there including B.B. King, Little Milton, Buddy Guy… he put everybody in there. After he did that, combined with Charlie’s Playhouse and Blues Boy Hubbard & the Jets, everybody considered Austin, Texas the music capital, you know. Everybody started talking about: “Oh yeah, Austin man. They got some heck of a musician in Austin…”; people just like the guitar player who’s playing with us –Motto. He heard about us in Japan and that’s how he wind up coming to Texas. When Motto came here he was already playing guitar but he was playing really jazzy. He said: “You got some blues licks?” And we got together on that. Right now Motto is one heck of a guitar player. He was the kind of guy that if you were good on the Eastside he hired you, because he hired me all the time. But he would rather get Chicago guys than somebody on the Eastside they think they’re a good guitar player or something like that. He stood by me all the way. I started teaching him bass to play and he said: “What I wanna do, Hubbard, is every time I bring Albert Collins I’m gonna call you and I want to bring Jewel –my drummer. I want you all to open up with my house band, but I want you to play with Albert Collins after that too. There’s not a whole lot of other guys that [Clifford Antone] would hire other than W.C. [Clark]. If you wasn’t real good he didn’t probably even mess with you. But like I said, he hired me and he hired W.C.
How different is the music scene now compared to when you started? Well, when I was playing guitar in the beginning there wasn’t a whole lot of Spanish or Mexican people playing blues but it got to grow bigger. The first somebody I knew that was a Mexican guy playing blues was called Little Sammy. He came from San Antonio, and played bass and sung. Then they had a group called Ruben Ramos and Alfonso Ramos. They used to come to Charlie’s on a Friday or Saturday and the two of them would get up on the bandstand. I think both of them was doing saxophone. Then the next thing they would bring their whole family, then one night they came there with a whole band. They put a band together and made big times putting out albums after albums. Then they had Mexican guys that played with black groups. As the years went on till about the seventies everybody –white, black, brown, green, was playing the blues. Everybody liked the blues and it was because of the beat. That beat there, you got to move, you got to like it. That’s what it was getting us over at Charlie’s Playhouse. Because once those fraternity brothers would come there, it was a beat they could feel and know something was different there. Charlie had a guy –we called him “Skivy Dee”, he’d let him in free so he could teach those fraternity kids how to dance black, because they were trying so hard. Skivy Dee would teach them how black people dance, and because of that they let him in free in return. He would teach them right there! [Laughs] A lot of them got it down, a lot of them never did. A lot of them brothers still dance on their tip toes, on the two’s and the four’s. But a lot of them got it on good. What do you think about the historical preservation of this community? When the Jimmie Vaughans, Stevie Ray Vaughans came to Austin it didn’t take long that people were saying that Jimmie Vaughan and Stevie Ray Vaughan brought blues to Austin [Laughs]. I had been playing in Austin twenty years before that guy got here! And then there was another guitar player, T.D. Bell, which nobody hardly mentioned him either. But T.D. Bell was the one that brought blues to Austin before I got here, you know. He played at the Victory Grill back in the forties! And another guy named Willie Bell, he plays blues guitar. But most of these guys don’t get mentioned because they didn’t do it big enough. T.D. did, because T.D. played a long time with Erbie Bowser, Grey Ghost… All of those guys was playing the blues long before Stevie Ray and Jimmie got in the know. But what it was, Jimmie and Stevie got in on the top floor. They came in where Muddy [Waters] was while we were just local 11th street and stuff like that. So we didn’t get as big as quick. But now, Stevie and I had a blues session on Sundays, way out east 6th, almost in Chicon. We did that all the time; then Stevie will always say: “Hubbard man, I want you to open up for me over at Antone’s.” And I opened up for him at Antone’s and stuff like that. It’s just who you know, that’s the biggest thing. What can you tell me about the Victory Grill’s current state? Well the Victory Grill right now is doing nothing, it’s just a building there. When it first changed like five or ten years ago, when Eva [Lindsey] first got in there, it seemed like it was gonna do something. Mel Davis –they play at the Continental on Fridays; they were sort of a house band there. Things were going pretty good. She would book the Eastside Kings and they would get some outside town groups. And then all at once nothing happened. [Harold] McMillan would book stuff, outside and inside. He booked us quite a few times, but right now that place is dead. Nothing going on too much. You pass by and I say: “Damn, is that open?” You just have to have something there every week otherwise it’s not gonna rest. You gotta have a band Friday and Saturday and it has to be somebody there every week in order for it to catch on. But a lot of people don’t have the money to do that. 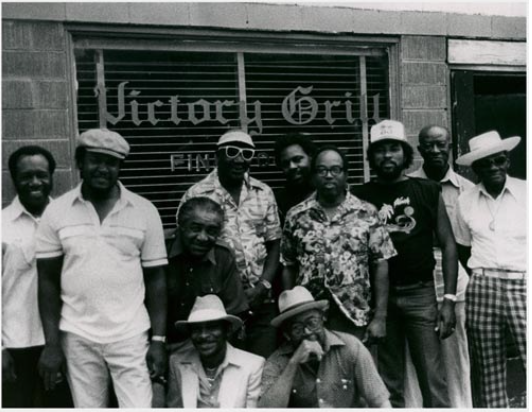 Victory Grill Reunion (L-R Standing) Henry "Blues Boy" Hubbard, James Kuykendahl, T.D. Bell, "Little Herman" Reese, William Fagan, B. Brown, Johnny Holmes, Grey Ghost, (Kneeling) Ural Dewitty and Erbie Bowser (Photo by Tary Owens). That’s not a club scene, a grocery’s store really is what it is. But they have the money to book bands and that’s the whole thing. HEB has money so they can book band and guarantee their money night after night, whatever night they want a band they can pay for it. That’s why everybody knows about it. They can book bands out of town, bands in town, then they got somebody to do the booking like Sean [Hopper]. We started off playing every other Wednesday at the South one and then we get some Saturdays North. Then it slept off because they got so many bands that they’re trying to book. We played Saturday and we hadn’t played in Central Market for two or three months. Everybody likes us when we play but they don’t care about that. Sean is trying to get all the people he wants in there. How does blues relate to jazz, rhythm and blues, soul, rock n roll...? Well, music is to me is music, it just depends on who’s playing it. I can hear a guy playing the blues that sounds exactly like a guy playing jazz. It has a lot to do with how good a musician is. If you look at most blues guitar players, they’re just not as good as a jazz guitarist. In other words, George Benson is super good on the guitar, Wes Montgomery is supergood, but Freddie King and Albert Collins ain’t that kind of super good. They’re just not as good. It’s not that the music is a lot different, but they’re gonna play a lot less notes. Freddie King, I’ve played with him lots of times, and he plays real good blues guitar. But B.B. King is altogether different. He stays on one string and cry there all night long, while Freddie King is going, man. He’s all over that guitar. Albert Collins is the same way even though he got that clamp on there. “Gatemouth” was the same way; they played a lot of notes. But nobody’s playing the kind of notes that George Benson, Wes Montgomery and all of those guys are playing. There are guitar players like Wayne Bennett, Guitar Murphy… those guys are very, very good at blues and jazz. Like I said, it’s just what you hear and how you label something, you know. If you listen to rock ‘n’ roll, really the big difference to me in rock ‘n’ roll and rhythm & blues is that if a white guy plays it its rock ‘n’ roll and if a black guys plays it its rhythm and blues. That’s the way it comes out pretty much all the time. Well, there are some white guys that can play the blues and sound like the blues. I know some, period. Like Derek O’Brien and Bill Campbell. Man, Bill Campbell plays the blues as good as any black guy. It just depends on the individual. If you got the talent it’s gonna come out, I don’t care what color you are. But there’s a lot of people that tries things that they are just not cut out for that. How has been your experience with recordings been? We won the battle of the bands one year back in the sixties. They said: “Well Blues Boy, you all got a contract and you can record anytime you want in the studio.” But that didn’t mean a lot. We had a studio where we could record; they had the engineer there and all that. We had our own material, you know. But after you do all that… that means nothing. You got a record that sounds good, so what? You need somebody that’s in the know. You need somebody that says: “Ok, here’s the contract. We’re gonna record you and we’re gonna push this record.” But that’s not what we had. We just had the right to get in the studio and record. But anybody can buy equipment and record –right now there’s a lot of guys in Austin that can do that. But to put it in action like Capitol, like Motown, like Don Robey… that’s what you need! It didn’t take us long to realize that, so we just stopped trying, you know. Until somebody does this to you, you usually just give up, because nothing from nothing leaves nothing. We recorded a 45rpm, but now what do we do with it? Y’all can sell them at the club, and we did that. We had a stack of 45s and you’d buy them, but you’re not really going anywhere like that most of the time. There’s a rapper right now that is big time, making millions, that says he started selling his 45s at the back of his car. But that don’t help me every day, things like that happen every now and then. I got a lot of stuff of us but it doesn’t mean anything. Well yeah, sometime but most of the time it ain’t. Me and James Polk, he had a jam session on Sunday. This was back in the seventies. It was like three pieces, then it went to four pieces… Blue Note wanted him to cut and we went in the studio and we cut some sides… but by that time Blue Note went out of business. Blue Note is back in business now but it’s just being lucky. Being in the right place at the right time, it’s who you know. That’s it. And I don’t care who you know, they’re gonna be getting the biggest part of the money anyway [laughs]. It’s just the way it is. One of those things. Yeah, a guy named Mickey Bennett he would always try and make us record. He would call me: “Blues Boy, I’m gonna send you some money and you go in the studio, record it and send it to me”. We did that in San Antonio but at the time that he was doing this Capitol was trying to push Lou Rawls. So they weren’t listening to nobody else. They weren’t trying to do anything with anybody else, but Lou Rawls. So we missed the gig! But anyway Mickey always did this for me. A year or so ago his brother got a recording studio in his basement in Georgetown. He paid us to drive there and record for like a week. We got like four or five different sides and he said we needed two or three more. We did that and then he called the company and had it made into a CD. At the bandstand we sell some real good, but we’re run out now and he’s decided not to do anymore. Plus right now Mickey is kind of sick. Do you have any lifetime favorite artists or records? Do you think bluesmen get better with age? Yeah, you get better. But music is a talent. I’ve been teaching the Peterson Brothers. The first time I met those boys they reminded of myself when I was their age. They are just bubbling over with talent, musical talent. They are real good at a young age. Alex is 11 and Glenn is 14. He was 13 when I first met him. They got it going. What I had to tell them was the right way instead of the wrong way, ‘cause they had plenty talent. I took Alex and showed them a lot of good bass lines, and Glenn on the guitar I just had to show him the right way to play something. I’d let him play something and then say: “Well, that ain’t quite it. Look at this…” Like he played “Hideaway” and I would show him things that Freddie King would do. Those two boys really got a lot of talent. They play house band in Smithville the other Friday. They opened up with a spiritual thing, and they had a white blonde girl who played violin real good. Alex plays violin too. Age is not what people make it out to be. Just because you’ve been playing fifty years that don’t mean you have to be the best guy at it. Guys come along and can eat you up. It’s how much of a talent you’re born with. That’s what makes the difference. But if you try and keep at it you’re gonna get better, you know. Do you have any next goals? No, at my age, boy, you ain’t worried about no goals! [Laughs] What I do is practice. See my guitar sitting there? I practice pretty much every day. I may not practice for hours but I’ve got a music station on my TV and I’ll turn it on at night –eleven o’clock, twelve o’clock, and they’ll play something. Right now, they got a lot of guitar players. They’ll do something and I’ll reach over here and get my guitar and work it out. I do that all the time. I try to keep myself in shape because for the more I look back there’s too many youngsters coming up! 76 years old. Everybody says: “well, you don’t look 76!” I exercise every Monday, Wednesday and Friday, I try to eat the right food, I don’t drink, I don’t smoke… I haven’t smoked in about thirty-five years and I haven’t had a drink in about five or six years. Maybe that helps, and exercising my doctor told me that helps to. Like I said, I don’t go to bed at 10 o’clock, 11 or 12. I don’t ever go to bed before 1.30. But I don’t get up before 9.30 either [Laughs]. I stay in the bed all morning and by the time I get up and come out the bedroom, you’ve gone through half a day’s work [Laughs]! This interview was conducted during fall 2010 as part of an ethnographic research stage in about Austin’s blues scene.